CSS keeps updating itself, in a way that you need to keep up with the changing features and tones of this stylesheet. You need to know the new syntax, and also the no-code methods that you can ideally use. 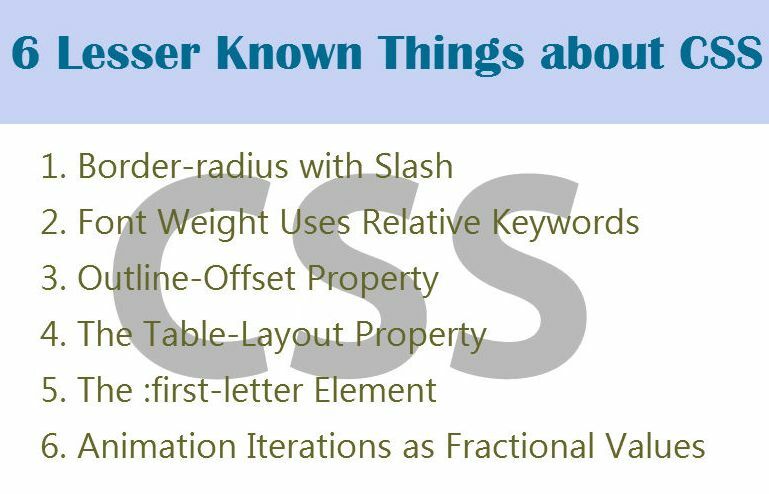 Here you will be introduced to some of the lesser known facts of CSS that will help you catch up with the details. If you want to define the radius for a shape that you are planning to use in your website, then you can use the slash property to define the border radius. Here’s how you will be coding it. For those, who feel this is not a valid way of entering the radius, think again! CSS has defined the slash property as valid. The values before the slash are for the horizontal radius while that after the slash set the vertical radius for the shape in concern. The mapping values have changed for each case, as shown in the code above. This is a relative method. With this property you can define the limit for the outline to be offset from the element in concern. This is a rarely used property, which you can use if you want to improve your debugging options. Normally, outline does not include outline-offset, and you will need to define it separately. Well, there is a limitation to this property. It is not supported by your IE browser, and that could be a setback. If you want to style the first letter of any element, then this is the property you should be using. This gives your first letter the drop cap effect, which is again extremely important. There is a standard that has been established over a period of time, which reflects how the first letter should be specified. This element property helps define the first letter in a standard manner. You can use the animation-iteration-count property to fix the number of times the animation will be played. The count can go from an integer value to half time, as specified by you. This is an interesting feature that you should use if you are creating animation in CSS. It is always good to tap on the lesser known coding procedures that CSS handles. You get a better idea of how to perform with CSS techniques. Hire Dedicated Developers to give out the best stylesheets and designs for your applications.